Saxonia was built in 1954 by John Brown & Co, Clydebank. She marked the start of a 90000 ton rebuilding programme for Cunard by John Brown. The four ships were primarily intended for the Canadian service, and their dimensions were determined by the St Lawrence Seaway. During the summer they would sail to Quebec and Montreal, and in the winter (when the St Lawrence Seaway is iced over) to Halifax and New York. 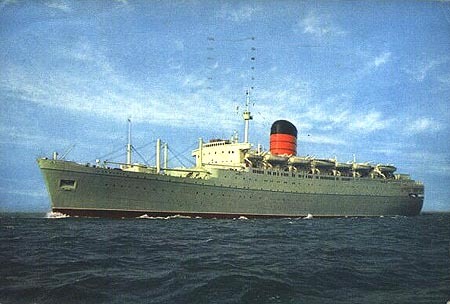 Saxonia was launched on 15th February 1954, and commenced her maiden voyage from Liverpool to Quebec and Montreal on 2nd September of the same year. She was 21637 gross tons, and 608 feet in length. She carried 110 first class passengers and 819 tourist class. 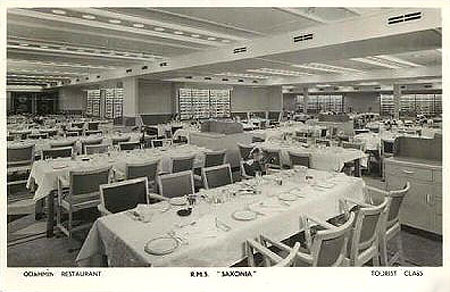 Her decor was contemporary for the time, and most unlike the traditional interiors of earlier Cunarders. Many regular passengers were not impressed, and the last two sisters, Carinthia and Sylvania, reverted to a more traditional style. 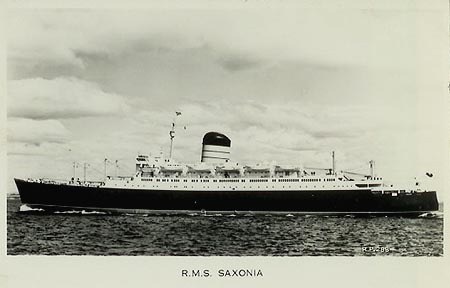 In November 1954, Saxonia switched to her winter route from Liverpool to Halifax and New York. 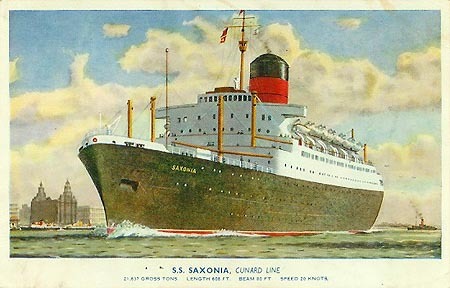 In 1957, Saxonia sailed from Montreal for Southampton, rather than Liverpool. Many of her sailings then included Le Havre, to tap the European market, whilst her sister Ivernia often called at Rotterdam. In the winter of 1958, Saxonia's sailings were made from the Thames. In January 1962 she was back at Liverpool, sailing direct to New York. 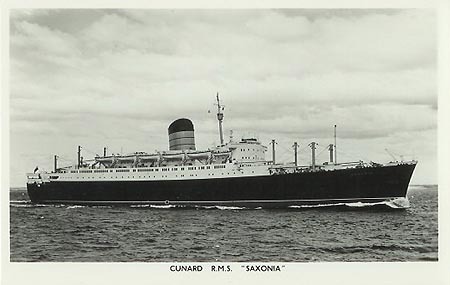 The late 1950s were boom years for Cunard, and Saxonia was initially very successful on her designed routes. However, air was becoming increasingly the dominant mode of trans-Atlantic travel, and Cunard announced a significant financial loss in June 1962. It was announced that Saxonia and Ivernia would be rebuilt at John Browns to make them more suitable for cruising. 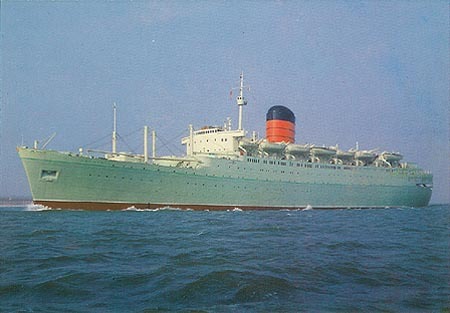 Saxonia had completed 116 round voyages across the Atlantic when she was sent back to her builders in September 1962, reappearing as the Carmania in Cunard's cruising green livery. The interiors had been refitted, and a new lido had been built on the aft decks, replacing the aft cargo hatches. passenger capacity had been reduced to 117 first and 764 tourist class, and air conditioning had been installed throughout. Her sister Ivernia joined her as Franconia soon afterwards. 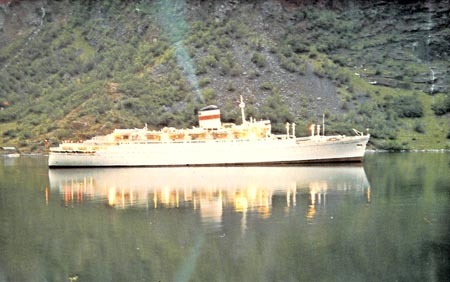 Despite the cruising modifications, Carmania re-entered service on the North Atlantic run in April 1963. She ran successfully through the summer and switched to her planned cruising itinerary from Port Everglades in the winter. Other ships in the Cunard fleet, including the Queens, were being sent on experimental cruises from this time. 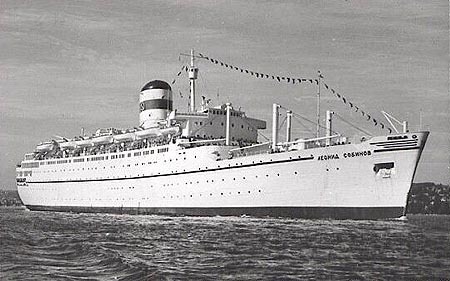 The later sisters, Carinthia and Sylvania, had continued on year-round trans-Atlantic service. Passenger numbers were dropping, particularly in winter, and Sylvania was sent on a cruise from Liverpool in February 1965, despite not being suited to such work. Carinthia followed suit on her first winter cruise in January 1966. May 1966 saw the national Seaman's strike in the UK. All four sisters were affected, being held at Southampton or Liverpool. Services were resumed in July, but the strike had a devastating effect on Cunard's finances. The following year, 1967, the announcement was made of the withdrawal of all Cunard liners apart from Carmania, Franconia, and the new Queen Elizabeth 2. 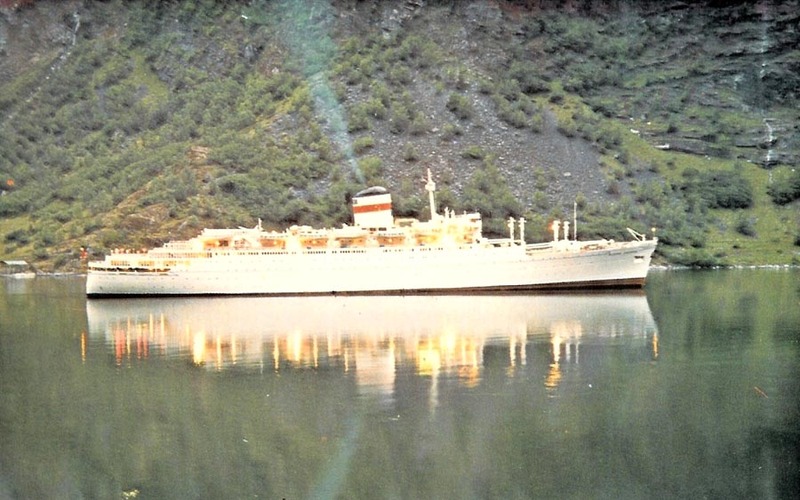 Carmania was used purely for cruising after a final summer on the Atlantic in 1967, and received a white hull at the same time. In 1970, Cunard took a 50% interest in Overseas National Airways, which had two cruise ships on order to operate on fly-cruises, forming the company Cunard-ONA. Shortly after this, ONA were forced to withdraw from the arrangement, leaving Cunard to continue alone. The ships were delivered as Cunard Adventurer and Cunard Ambassador. In 1971, Cunard was taken over by Trafalgar House. 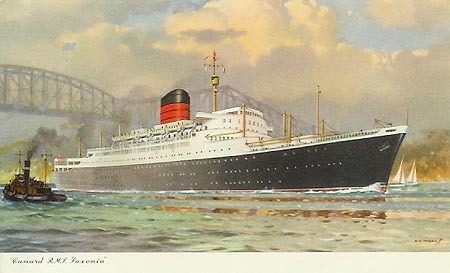 They looked at upgrading the Carmania and Franconia, but decided it would be too expensive, and the ships were withdrawn and offered for sale, to be replaced by the new Cunard Adventurer and Cunard Ambassador. 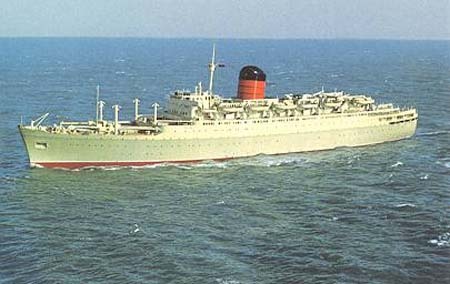 Franconia left on her last Bermuda cruise on 2nd October 1971, whilst Carmania's last cruise left Naples for Southampton on 24th October, arriving on the 31st, the last day of the four sisters in Cunard service. Carmania and Franconia remained at Southampton for seven months, when they were moved to the River Fal, where they joined the Southern Cross which had been withdrawn shortly after them. At one point is was hoped to sell them to Ted Arison for his fledgling Carnival Cruises, but agreement could not be reached. Carmania and Franconia eventually began new careers under the hammer and sickle as the Leonid Sobinov and Fedor Shalyapin. The sisters received very little interior changes before beginning a varied career as Soviet cruise ships, travelling all over the world. Following the break-up of the Soviet Union in 1989, the sisters became owned by the Ukraine, although nominally belonging to Maltese holding companies. Their condition deteriorated over the next few years and they were both laid up in the Black Sea in 1995. Leonid Sobinov was broken up in 1999, although her sister remained laid up for some time longer. 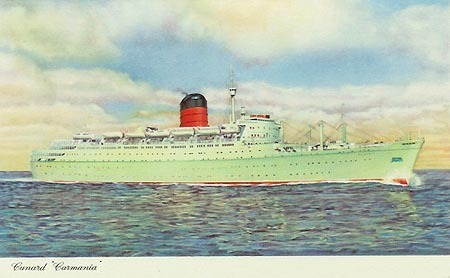 J.Arthur Dixon postcard of Carmania (ex-Saxonia) with green hull. Same ship image as the card above, but different cloud effects. 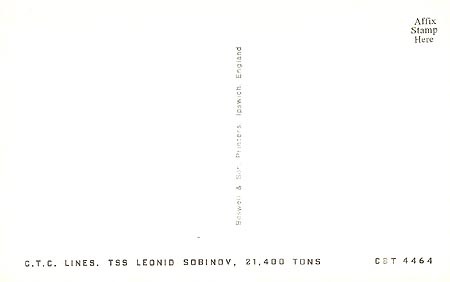 CTC postcard of Leonid Sobinov. Photographic postcard of Leonid Sobinov.